Every plastic surgeon’s short list of hoped for advancements would include body Bondo, a skin shrinking ray and made-to-order body parts. Well, we may be getting a little closer to spare parts off-the-shelf. Cornell bioengineers and physicians armed with a digitized image of an ear, a 3-D printer and a cellular Jell-O are able to produce structures as complex as the cartilage of the external ear. This is incredible news for anyone born without an external ear (1-4 per 10000 births) or who has lost their external ear due to trauma or cancer. Most ear reconstruction involves rearranging any available parts. When the entire structure is missing, the needed tissues must be borrowed from other parts of the body. While skin is readily available, cartilage for the complexly shaped frame work is not. Currently, it needs to be borrowed from the junction between the sternum and the ribs, and the structure needs to carved and assembled into the proper shape. It takes a fair amount of artistry to get the best results. When both ears need to be reconstructed, and one reconstruction fails, there may not be enough cartilage left for another attempt. There are many advantages to the availability of ears off-the-shelf. The most obvious is the potentially limitless supply, but there is also no donor site to heal. Since the new ears can be digitally designed, the shape can be easily modified. 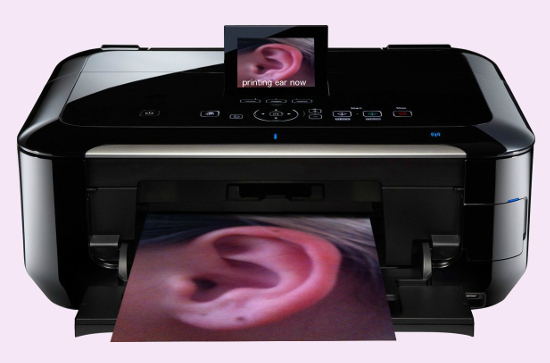 When the opposite ear is normal, it can be scanned, digitally flipped and manufactured for a perfect match. What Else Can We Make? Anything made of cartilage can be fashioned. Plastic surgeons are looking forward to ears and nasal tips. If the cells could be made firm enough, my Orthopedic colleges may be able to reline, rather then replace, joints. While hips and knees may be farther off, fingers with less weight bearing seem a hopeful candidate. Of course, the friction experienced in joint means the cartilage must be self repairing or it will quickly wear out. In cases of severe bone loss, bone grafts are currently used. If the cartilage can be treated with a bone morphogenic protein, artificial bones are logical leap. In cases of severe trauma or bone cancer, new bones could replace metal hardware. Otoplasty is any procedure used to change the shape of the ear. The most common procedure is ear pinning, to reduce prominent ears. In these cases the cartilage is more than adequate, so 3-D printing is not necessary. Off-the-shelf ears are a help when there is not enough or a complete absence of ear cartilage. For more information, click the link to the Cornell Chronicle.